Monday “FIESTA” will start off the week with a live performance by OLIVIA HUTAGALUNG. Tuesdays “NOTORIOUS” RnB/Hip Hop event with live music by BLACKLINE followed by DJ T-SHA. Wednesdays “LADIES NIGHT” is for you girls! Live music by MR. WHOOPER. Thursdays “BEERS & WINGS” is our ALL-DAY happy hour. Live music by SOUTHERN AM followed by DJ AZKA. 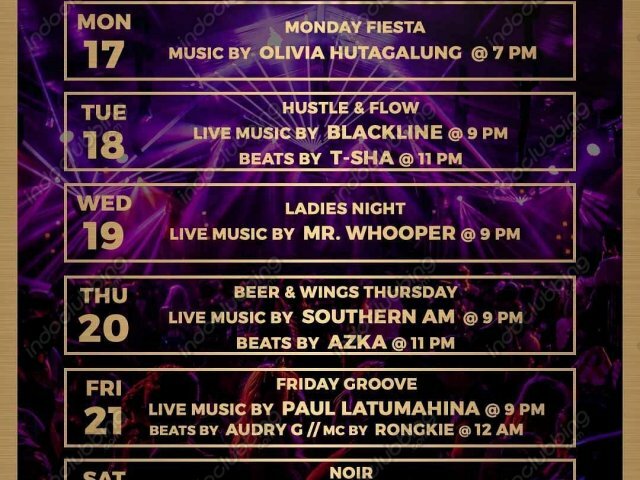 Fridays “GROOVE” with a live performance by PAUL LATUMAHINA and then taken over by DJ AUDRY G with RONGKIE as MC. Saturdays “NOIR” with a live and exclusive performance by GROOVE MOTION followed by DJ’s FENDY x ANDRE YOSAN.